(SANTA FE, NM) New Mexico Governor Bill Richardson and Attorney General Gary King today criticized the U.S. Environmental Protection Agency (EPA) for violating the federal Clean Air Act by fast tracking a permit for the proposed Desert Rock coal fired-power plant without completing the proper reviews on important air pollution issues. Governor Richardson and Attorney General King assert in their letter that EPA’s recent proposal to expedite the permitting decision for the proposed plant without conducting required environmental analyses of hazardous air pollutants could have severe negative impacts on air quality for New Mexicans and others in the region. The proposed plant, under the jurisdiction of the Navajo Nation, would be in northwest New Mexico. (RIO RANCHO, NM) Responding to congressional demands and a 2006 series in the Los Angeles Times, the federal government has laid out a $161 million plan to prevent the spread of radioactive contamination on sites across the Navajo Nation. The plan, released earlier this month to the House Committee of Oversight and Government Reform and its chairman, Rep. Henry Waxman, D-Calif., calls for the clean up of the Northeast Church Rock Mine near Gallup as well as a survey of structures and wells for contamination. During a radio interview on Tomorrow Matters 101.1 FM in Santa Cruz, California, Larry King and Woven Ways director Linda Helm Krapf discussed the dangers of uranium mining on the Navajo Reservation with Bay Area listeners. Larry, who is featured in Woven Ways, was in Santa Cruz with Linda for the film’s world premiere at the Earth Vision International Environmental Film Festival in March. To listen to the informative half-hour radio show, click here. Thanks to the generosity of donors, we're taking Woven Ways on the road again, as momentum builds for the issues the film raises. We're very excited to be heading back to the Navajo Reservatio next month for several important screenings. The trip begins at St. Michael's High School in the Navajo Nation Capital in Window Rock, Arizona. Teachers at the school have organized a screening and a discussion for Navajo students. From there it's on to Santa Fe for the National Trival Environmental Conference, where the film will be used to introduce some of the threats brought about by energy resource projects. 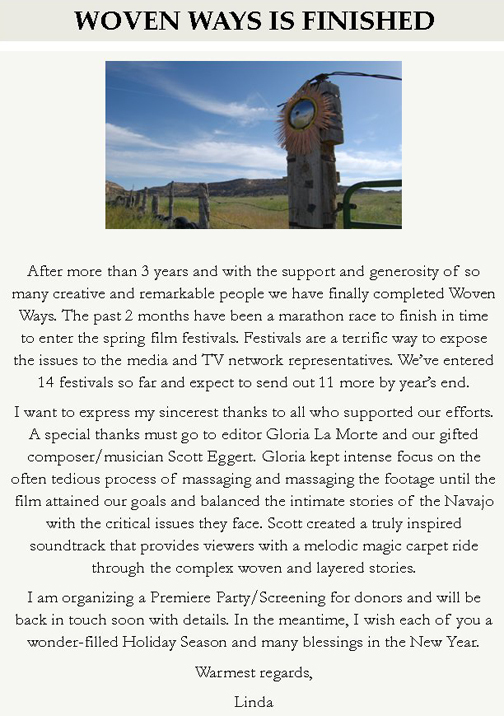 Other screenings include a film festival in Grants, New Mexico, and a major media event where the Navajos featured in the film and leaders from the grassroots organizations they represent will speak at a press conference for local and regional press and media outlets. In May, it's on to Washington, where Woven Ways has been accepted into two film festivals. The Hazel Wolf Environmental Film Festival in Seattle brings compelling environmental stories from around the world. The Rainier Film Festival will take place at the base of Mt. Rainier in Ashford, Washington. We plan to make the most of these events and use them as opportunities to engage political leaders, audiences, and the press in the critical issues facing the Navajo. You can help by giving your FREQUENT FLYER MILES, TRAVEL COUPONS, OR DONATIONS to cover expenses for Navajo activists to attend these important events. 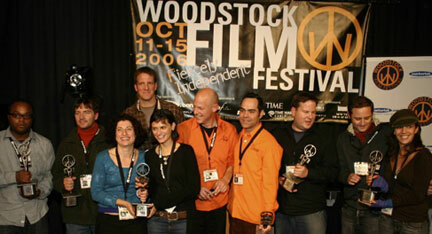 FOR THEIR FILM, "AUTUMN'S EYES"
Congratulations to our new editors, Gloria la Morte and Joseph la Morte, who were awarded with “Best Editing of a Feature Documentary” for their wonderful film "Autumn's Eyes" at the 2006 Woodstock Film Festival. The NYC-based company is one of the most highly respected distributors of social justice documentary films. We look forward with great anticipation to meeting with Michelle when we’ve finished the film to discuss a future relationship with this giant in the documentary distribution arena. Grants from charitable foundations are very important for this film project. We have just received our third grant, this time from the Puffin Foundation. The grant will be used to cover expenses of the next filming trip to the Navajo Reservation this summer. Award-winning documentary editor Dena Seidel has many gifts as a film professional. One of the most extraordinary talents is for finding the storyline from dozens of hours of raw footage. She recently completed editing a 30 minute ‘work-in-progress’ piece that we can use for fund raising to introduce our feature characters and to provide background information about some of the serious issues they face every day on the Navajo Reservation. We’ve been screening the DVD at churches, community meetings, and in the homes of supporters. If you would like to host a screening and fund raising event in your home please contact us right away! Our small and dedicated crew heads back to the Navajo Reservation in June. Filming locations include a return visit to the Crownpoint Rug Auction. We hope to follow Felisha House, a young weaver from the area who plans one day to sell her own rugs. If the proposed uranium mining project moves ahead, Felisha and her family could be left without any clean drinking water, as geologists predict that the mining process will contaminate the aquifer that surrounds the uranium deposits. After a year of planning, we’re anxious to make the pilgrimage to the Chuska Mountains with TahNibaa Naataanii and her Churro sheep herd. The trip will provide a great vantage point from which to film the ever-present floating plume of highly toxic pollution that drifts southward from two dirty coal power plants in the region. Lastly, we are hoping to arrange an interview with Navajo Nation President Joe Shirley. 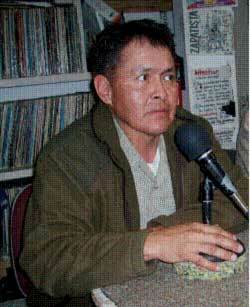 Mr. Shirley has recently signed a ban on all new uranium mining efforts on the Reservation. Unfortunately, the legislation has not halted plans by the mining companies and the US government to extract the uranium. The Navajo president has stated publicly that any challenge to the new ban would constitute a breach of the tribe’s sovereignty. This urgent issue helps fuel us to complete our film as soon as possible, so that we can share this story with the American people. Woven Ways has received its first major grant from the LEF Foundation. The funds will be applied to the cost of equipment, travel, and production staff for filming that will resume on the Navajo Reservation in July. Navajo Nation President Joe Shirley, Jr., signed the Diné Natural Resources Protection Act of 2005 in a signing ceremony Friday, April 29, 2005, at the Crownpoint Chapter House. The President’s signing of the first Navajo Nation law ever enacted banning uranium mining and processing in Navajo Indian Country took place in front of the Crownpoint Chapter House water station from which thousands of people haul water every year. ENDAUM members and supporters were on hand to display their WATER IS LIFE banner and discuss the new law. The historic legislation, which was passed by the Navajo Nation Council by a vote of 63 - 19, is based on Navajo traditional law, finds that the prohibition is needed to address the deadly legacy of past uranium mining on Navajo lands and to protect the economy, environment and health of the Navajo people from future uranium mining and milling.